Flippity is my favorite place to find templates for creating neat things in Google Sheets. A MadLibs story generator is one of the cool templates you'll find on Flippity. Flippity's MadLibs template lets you create a series of MadLibs-style stories for your students to complete online (see a demo here). To create a MadLibs-style story generator first select the template on the Flippity homepage. Then you'll be asked to make a copy of the template in your Google Sheets account. 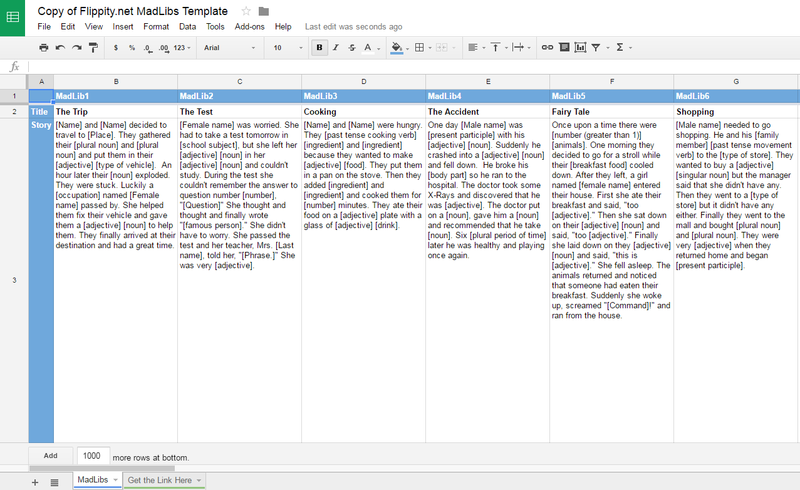 Once you've made the copy you can edit the template by writing your own stories into the spreadsheet cells. To define variables, those are the parts your students will complete, simply place brackets around the words "verb, noun, adjective, place, name, or number." 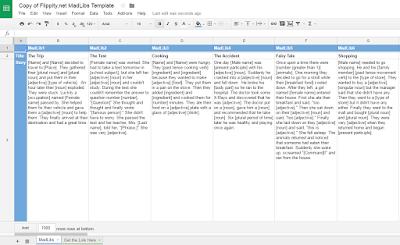 For example, if I want students to fill in a noun in the story I'd write [noun] in the spreadsheet cell in which I'm creating my story. When your completed work is published your students will see something like this on which they'll complete the MadLibs story. Using your MadLibs-style stories could be a fun way for your students to practice identifying parts of speech. When they use verb instead of a noun in a MadLibs-style story, the story doesn't make quite as much sense as it should have. If you have students that are comfortable using spreadsheets, they could use the Flippity template to create and share their own MadLibs-style story templates to share.